So begins Spreading the Wealth by Stanley Kurtz, a senior fellow at the Ethics and Public Policy Center. Written before President Obama’s re-election, Kurtz’s book—whose prose reads like Harold Hill’s pleas to the people of River City in The Music Man—warns that the president’s sec­ond term agenda will impose regional tax sharing policies to redistribute suburban tax revenue to city coffers. Such policies, Kurtz argues, will result in a de facto abolition of suburbia, dis­couraging further sprawl and leading to metropolitan annexations. 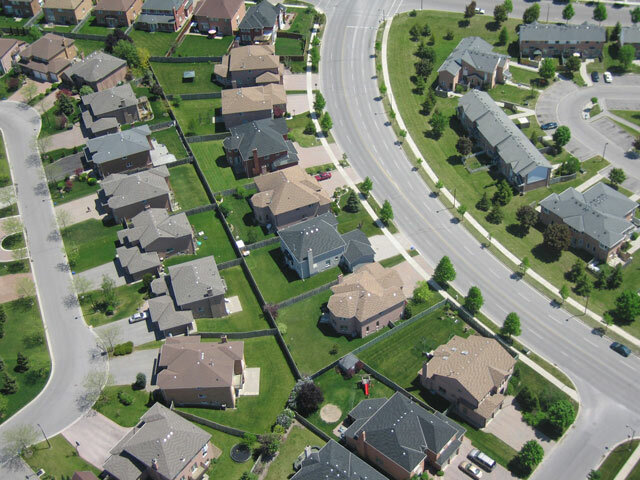 Whether or not there is merit to Kurtz’s argu­ments about tax policy, his impas­sioned rhetoric presents the preserva­tion of suburbia as a self-evident good, inseparable from the American Dream. There is broad popular assent to that position. Suburbia, after all, is right up there with baseball and apple pie in the list of things all-American. But does it truly deserve that niche in the American pantheon? Suburban sprawl, characterized by enormous houses, big-box stores, massive park­ing lots, and high-traffic multi-lane roads, is in conflict with the tradi­tional wisdom about the connection between the built environment and the moral order. This doesn’t mean that all people who live in suburbia are somehow morally deficient, or that those who live in cities are angels. But there is, nevertheless, a relationship between the places we build and how we flourish as human beings. Tradi­tional urban neighborhoods and small towns are better suited than suburbs to promote this end. We are, therefore, in need of their restoration and of a reconsideration of our social and cul­tural aspirations as Americans. In the Politics, Aristotle says, “the best way of life, for individuals sepa­rately as well as for cities collectively, [is] the life of goodness duly equipped with such a store of requisites as makes it possible to share in the activities of goodness.” The philosopher outlines the things a good city needs to serve this end. It must be small enough that everyone knows each other’s character, at least by reputation. It must provide for all citizens’ basic needs and safety. It must have both religious institu­tions, to keep individuals and the city focused on the life of goodness, and civic authorities, to ensure justice. Aristotle isn’t a staple of most urban design curricula today, but until recently, his particular understand­ing of the city and its moral structure guided the way people built and lived in towns and cities, even in places where citizens had never read or even heard of the philosopher. Take for example the working class Chicago neighborhood, centered on the Cath­olic parish St. Nicholas of Tolentine, profiled in Alan Ehrenhalt’s book The Lost City. The parish territory covered about an eight-by-eight square of city blocks with fifteen thousand total res­idents—similar in size to the typical ancient Greek city-state. Most people belonged to St. Nick’s parish and knew each other through the church and other neighborhood associations. Families lived in bungalows with front porches and small yards, close to the street and the next-door neigh­bors. Locally owned groceries, stores, and banks within walking distance of every neighborhood home served each family’s needs and provided jobs. Chil­dren played on the street as if it were the neighborhood living room, and each troublemaker understood that any passing parent had a right to lay down the law. The church was both literally and figu­ratively the center of the neighborhood. Its pulpit and parish school—as well as the parents who were brought up with these institutions—were charged with teaching right from wrong. The author­ity of the church, school, and family in this neighborhood built the bridges between the morally untutored man and his potential for holiness—his life of goodness. The prominence of the neighborhood’s religious and civic institutions and its relative density were an ideal representation of Aristotle’s communitarian values and of his concern for communities that pursue and share in activi­ties of goodness. The example of St. Nick’s parish was largely typical of most American small towns and urban neighbor­hoods until the first half of the 20th century. Though particular neighborhoods may have been more-or-less exclusively populated by an eco­nomic or ethnic group, the basic charac­ter of the urban life was common to most neighborhoods. Nevertheless, such places increas­ingly existed in tension with the mod­ern concept of the American Dream. Historian James Truslow Adams coined that phrase in 1931 in The Epic of Amer­ica. Adams defined it as, “that dream of a land in which life should be better and richer and fuller for everyone, with opportunity for each according to abil­ity or achievement… It is not a dream of motor cars and high wages merely, but a dream of social order in which each man and each woman shall be able to attain to the fullest stature of which they are innately capable, and be recognized by others for what they are, regardless of the fortuitous circumstances of birth or position.” Adams’ definition affirms Tocqueville’s observations of American tendencies towards materialism and isolation. Though he tries to temper their importance, Adams does not deny the individual pursuit of worldly goods and status (as opposed to happiness, or the life of goodness) for their own sake. There is no word about the role of the community in promoting the best life, or about the individual’s duty to build and preserve that community for others. The suburbs came to represent those habits of materialism and isolation. Middle-class families left urban neigh­borhoods for larger, more secluded homes on the city outskirts, where drive­ways pushed homes away from the street and garages replaced the semi-public realm of front porches. Few suburbs had a clear neighborhood center. For the first time, it was easy and inexpen­sive to live, work, shop, learn, and pray in places that were miles apart. Because of the automobile, communities could now be physically separated from deeply rooted social bonds, places of worship, and civic institutions. If the car made that divorce in our daily lives possible, the Supreme Court made it inevitable. The 1926 case of Vil­lage of Euclid vs. Ambler Realty Co. upheld zoning laws that restricted property development by classes of land use and effectively enshrined suburbia in the law. To explain how zoning dramati­cally changed the way modern towns and cities take shape, the architect Leon Krier uses the analogy of a pizza: In a traditional city, residential, commercial, industrial, and civic buildings are like the toppings on the crust, layered and mixed together evenly. The zoned city, on the other hand, is like a pizza with all the sauce on one slice, all the cheese on another, and all the other top­pings on yet another. Modern cities—not just suburbs—tended to be more isolated places, too, as a result of both our zoning laws and the culture of land devel­opment since World War II. Few major American cities were spared from the “urban renewal” projects of the 1950s and 60s, which leveled entire neighborhoods (often pre­dominantly African-American communities) for inhumanely scaled modern buildings, highways, and parking lots. The vertical sprawl of high-rise construction harmed communities in a different way. Though historic city centers became denser with skyscrap­ers, that density coupled with single-use zoning gave rise to the phenomenon of rush hour and the need for expensive highway and mass transit infrastructure. Traffic studies encouraged unnecessar­ily wide high-speed roads to get motor­ists from their suburban homes to their downtown offices at the expense of safe, interesting, and beautiful places to walk. On-site parking requirements forced property owners to build parking lots that separated pedestrians from the street and took up more land than the buildings. Today, nearly every munici­pality in the United States has adopted “Euclidean” zoning ordinances. Even in the rare places where they do not exist (Houston, Texas, is a notable example), most urban designers of the last sixty years have built places around our cars instead of thoughtfully incorporating our cars into places built for people. This history makes clear that any attempt to “abolish” suburbia—as Kurtz claims the President intends—would require more than just the political will to overturn more than eight decades of law that encourages or mandates sprawl. It would require the ability to single­handedly change a mainstream culture that reinforces anti-urban attitudes and behaviors. We find it easier to drive to a big-box store for all our needs than to patronize smaller local stores. Most of us are not yet willing to give up a 2,400 square-foot house with a giant front lawn, especially if we have chil­dren. We can’t imagine living any other way, though many of our grandparents raised families larger than our own in homes half the average size of a modern suburban house. Well-meaning parents have bought into the faulty idea that sprawl is necessarily better for raising and educating children. There are reasons to be cautiously optimistic for a renaissance of good urbanism. In 1993, a group of architects and planners, disillusioned by decades of anti-urban attitudes, formed the Congress for New Urbanism to preserve and promote traditional neighborhoods and to revive the timeless principles of place-making. Though New Urban­ists remain on the fringe of the profes­sion, they have reintroduced concepts like neighborhood centers, mixed-use buildings, and walkability to design. A few schools of architecture now teach a New Urbanist curriculum, occasionally coupled with philosophical discussions about the best way of life for people and cities. In some cities, form-based codes now address problems created by con­ventional zoning. They allow mixed-uses, require main street buildings to be closer to the street, deal with parking more sensibly, and ensure that build­ings aren’t too big for the neighbor­hood’s character. The small successes of the New Urbanist movement are knit­ting back together the threads of com­munities whose fabric was torn apart in the last century. Citizens and municipal governments alike are learning that sprawl is no longer fiscally sustainable and that there must be alternative ways to build. The price of gasoline and expense of car ownership underscore the practical value of mixed-use, walkable neighborhoods. The high cost of building and maintaining roads and infrastructure means low-density suburbs with lower land values take on so much debt from building sprawl that the payments last longer than the lifetime of the improvements. Marohn points out that local governments—unwilling or unable either to raise taxes or to secure grants from state or federal agencies—eventually finance sprawl by encouraging more sprawl, for a larger tax base that in turn requires more roads, infrastructure, and debt. The only way to break the cycle is with a return to higher-density neighborhoods and pedestrian-scaled streets. Traditional neighborhoods and small towns may do a better job promoting human flourishing and virtuous happiness, and fiscal concerns may force places to become more dense, but there is no such thing as Field of Dreams urbanism. If you build a traditional neighborhood, community will not just come. Many of us already recognize the practical benefits of living in mixed-use, walkable neighborhoods, but we often aren’t willing to invest the time away from televisions, laptops, or smartphones to build social capital with neighbors. A beautiful and well-designed neighborhood supports a community, but only good people can sustain it. In his collection of essays, Till We Have Built Jerusalem, Philip Bess, Director of Graduate Studies at the University of Notre Dame’s School of Architecture, argues that the revival of communities requires institutions and individuals oriented towards lives of moral and intellectual virtues with the patience and fortitude to endure and confront a society lacking those habits. The task for these modern Saint Benedicts, in this world but not of this world, is to redefine the American Dream by their example. That definition must reject materialism, unbounded individualism, and placeless mobility, misidentified as inalienable rights under assault in the hysterical fear of Stanley Kurtz. The renewed American Dream must instead prioritize and encourage virtues of solidarity and stability that had once been intuitive to traditional community life, whether in the city-state of Aristotle or the parish neighborhood of St. Nick’s, with a steady vision of building places worthy of human beings. Will Seath is an architectural designer. A native of Pittsburgh, he first became seriously interested in traditional architecture and urbanism during college, when his family's neighborhood bar, restaurant, and apartment were razed to build a drugstore parking lot. After a brief career in radio journalism, he returned to his alma mater, the University of Notre Dame, for his graduate work in classical architecture and urban design. Will and his wife, Annalee, now live and work in Washington, D.C.